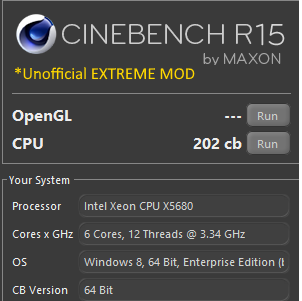 [ANN]CINEBENCH R15 EXTREME! - Unofficial MOD for the community to Stress HEDT platforms. Discussion in 'Benchmark Mayhem' started by HWgeek, Feb 2, 2019. I am happy to share with you my small Mod for the Popular R15 benchmark! As you all know, since AMD ThreadRipper 2990WX came out the CINEBENCH R15 looked too easy for this monster CPU, the Scene Renders too Fast . Now we also got the new Intel Xeon W-3175X 28-core and many Overclockers playing with the CR R15 and the current version cannot stress enough those CPU's and the scores fluctuation too much. 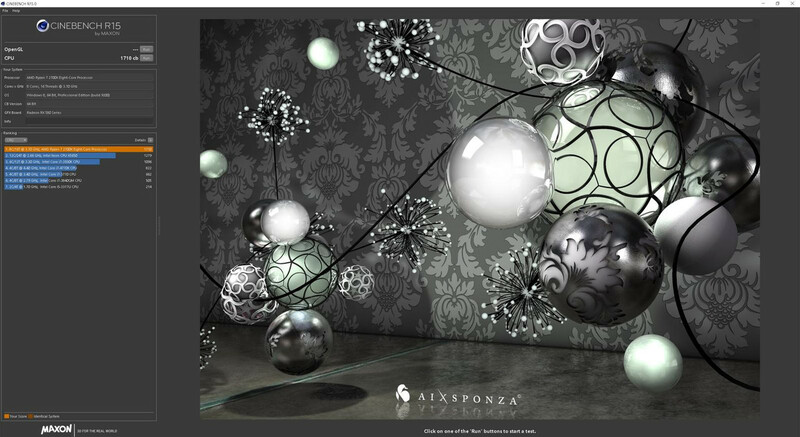 So I played with the files of the benchmark and I force it to render X4 Times the resolution! Plus, I edited the textures to make this "R15 EXTREME MOD". Now the Render times is over 80 seconds vs around 25 seconds on stock Ryzen 7 2700X (new score around 430 vs 1700)! with this Mod you can better evaluate Notebook CPU's performance since even with single run you can throttle the CPU clocks unlike the Original CB R15 that finishes too quickly. Just Replace the original "plugins" folder inside "CINEBENCH R15.038_RC184115" with my modded "plugins" folder. Now We are Ready for the Next ThreadRipper and Ryzen Generation! Enjoy and please share your scores with the community . 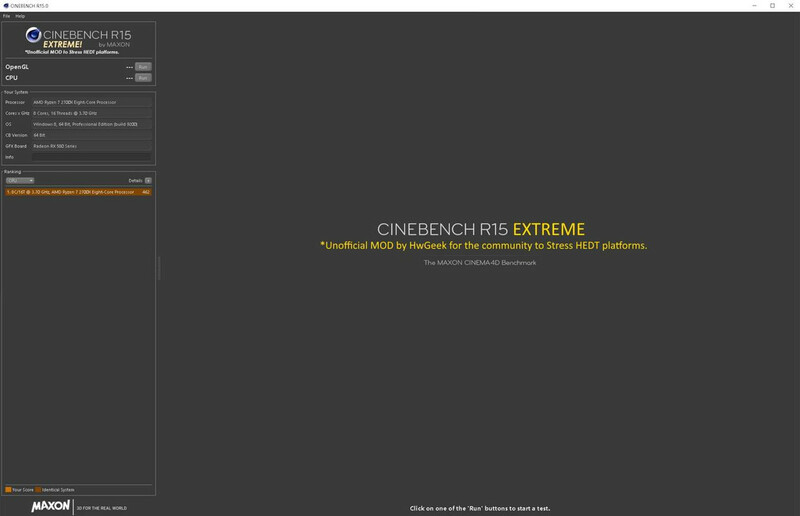 CINEBENCH R15 EXTREME! was added to Hwbot.org as Beta, so you can start sending your scores . SoulRipper, chispy, mohiuddin and 2 others like this. 2700X - 464 points while regular stuff runs in background (includes video playback, steam, Firefox, ...). mohiuddin and HWgeek like this. SoulRipper, Fox2232, jura11 and 1 other person like this. The result is exactly a quarter of the score I get from the official version of the benchmark. 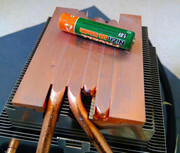 This mod is indeed more suitable for the top-end HEDT builds, as pointed by the author. Question: If it's only exactly 4 times the resolution, and, if like the above suggests that they will be exactly 1/4th the score due to it (within margin), how does this help test HEDT programs? The issue stated is that with such high end CPUs, it's done too fast, but the score will reflect that, if it's only 1/4th the score that it'll show now and take 4 times longer due to the 4 times resolution, it won't change the fluctuation in score, simply the fluctuation in score will be 1/4th what it was, correct? Example: If the 2990WX's score fluctuates between 5050 and 5150 (which is what i've seen, non-overclock), then this "extreme" will make the 2990WX fluctuate between 1262 and 1287, which is the same fluctuation, even if it simply is "smaller" number between the two. So is that the purpose of this? to shorten the number difference between them but not the percentage difference? 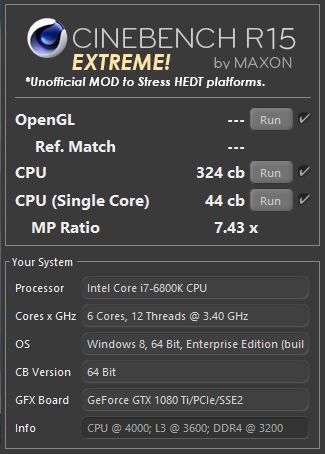 Another reason: For 2990WX and similar CPU's it's very easy to run CB R15 while OCed hard since the stress is only for few Seconds, but now if the Render times is over 3 times then the max OC could be lower since the system will crush in the middle of the test, so obtaining same relative scores with the stock R15 will be harder. 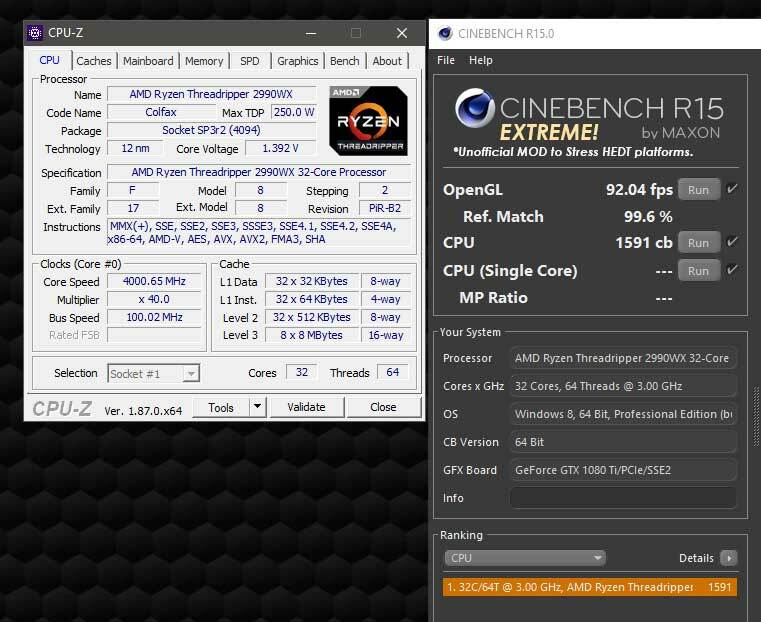 Also soon we could get 48C~64C Threadripper, and for them CB R15 will be too easy, don't know why CINEBENCH not being updated to stress those high end CPU's. Moreover, as I mentioned Mobile CPU's bench, new 4C/6C can finish the render withing the Turbo duration and without saturating the Cooling system, so for accurate score many Reviewers are doing multiple CB R15 runs to show the score fluctuation after the cooling is over saturated and the CPU start to thermal throttle, With this Extreme Mod you will get more real performance numbers since if the cooling is bad it will start to thermal throttle before finishing the render, For example I compared my Xiaomi Notebook Pro with i5 8250U (Max Turbo 3.4Ghz) vs Lenovo Yoga 730 with i5 8265U (Max Turbo 3.9Ghz) and with unlocked TDP I can get 182 points in CB Extreme while the Lenovo cannot get over 150 (cos Thermal throttle). Makes sense, and yeah it would be nice if they were to create a more intense, but based on the same scoring scheme R15 that's official. I think I can make it render same X4 the resolution while giving the official R15 scores that we are familiar with, but they will not be 100% the same in cases were the Turbo duration is over or Thermal throttle will kick in since the render takes longer, with same clocks for the full render duration they should match. EDIT2: I think for now lets not play with it, the new score represents the relative increase in the workload . jura11, chispy and HWgeek like this. 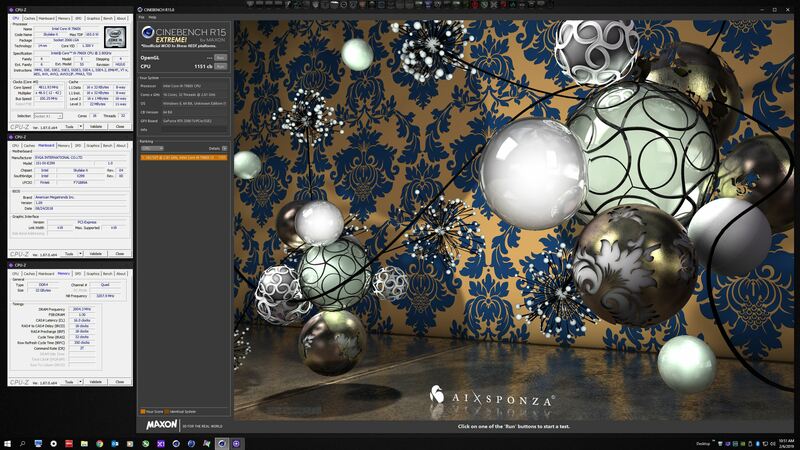 Good News, CINEBENCH R15 EXTREME! was added to hwbot as beta, so you can start sending your scores . chispy, jura11 and slovak_killer like this. nice to hear that thanks kicsi and Lawrence. Did another run with PBO enabled, Ram @ 3066Mhz and Hair dryer on cold setting since the stock cooler goes upto 84c . I run it on safe mode to disable many programs/processes that are running on background and got few extra points. P.S- I did another round of lapping the base of the stock coller, now its smoth,flat,no gaps between the heatpipes. Geez! Such a long time and noone thought of doing this(if it was done or thought of before I apologize), until HWgeek did! It's of those things you say: Why didn't I think of that? Awesome job HWgeek! Kudos and congrats for HWBot bench entry! 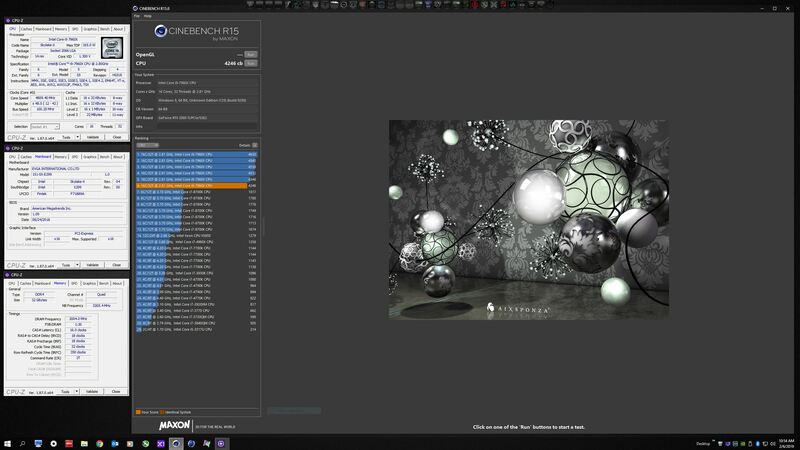 Cinebench R15 Extreme *bad dpi scaling. 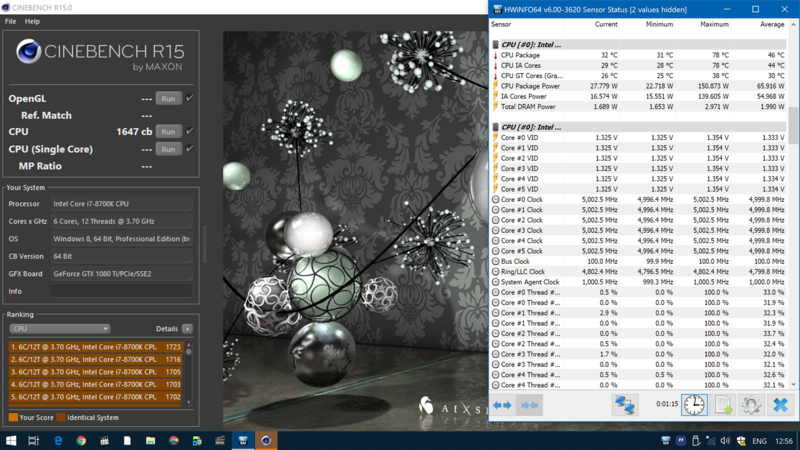 412cb on AMD Ryzen 1700 3600MHZ all core. Nice long benchmark, no need to run it multible times anymore. How easy is it to mod, is it possible to let it run normally 10 times and then display the runs in the rankings window? I think the idea is letting the benchmark run for longer and catch some thermal throttle. Nice mod. Good job. 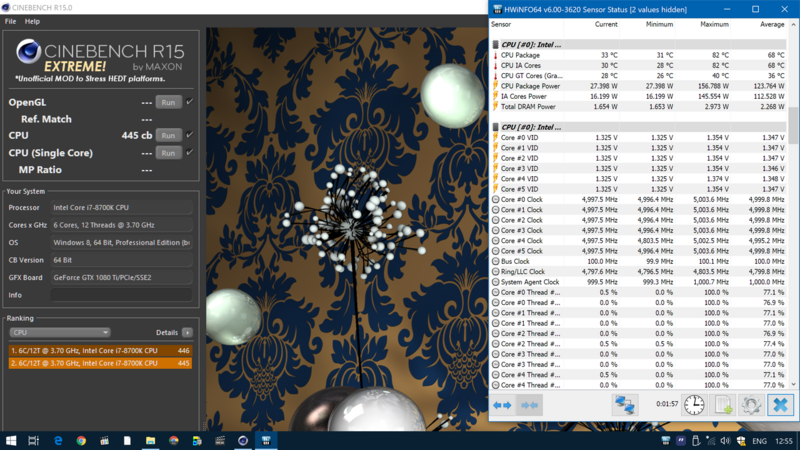 I only ran it at 4.8GHz this time just to see how it worked. Next time I do a direct connection to my chiller I will run it at 5.2GHz. I could see this mod being an issue for people with 1080p screens. 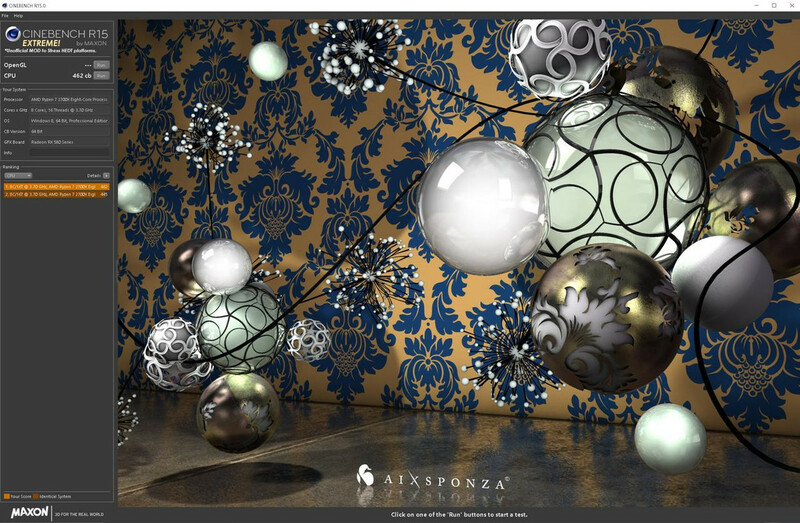 The window cannot be resized properly for lower resolutions, so they won't be able to submit valid scores on HWBOT if it ever becomes eligible to receive points because the CPU-Z windows cannot be covering the render scene area. If you do that the submission will be disqualified. HWBOT would need to change the rules to accommodate that. I am still searching if we can scale it down, If someone has an idea I will be happy to learn. For now- maybe 1080P users can use RADEON/NV screen resolution upscale in drivers to make it ~2K/4K and take full screen print-screen? jura11 and HWgeek like this.